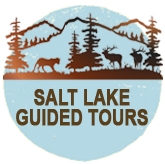 Salt lake city guided tour has the best tour guides in town. The guides take pride in showing off our great city and educating you on the history of Utah and the Mormon pioneers who settled the valley. Imagine changing one of these tires!! Luckily you won't have to at the Kennecott Utah Copper Mine. Nestled in Utah's Oquirrh Mountains this mine is a geological wonder. So deep the Empire State building, on top of Chicago's Willis Tower would not reach the top. The visitor's center is well put together with models of the mine through the past century as well as examples of all the household products we take for granted, that are created with minerals that come from the Earth. The gift shop, benefitting the local Lions's club, has many interesting souvenirs including copper post cards. Brett, Chris, and Brad (pictured l-r)with Salt Lake City Guided Tours will be happy to provide you with informative, enjoyable tours.